During last weekend’s match at Saint Francis, the No. 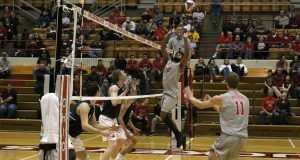 1 Ohio State men’s volleyball team struggled to maintain a lead early in the first set. The Buckeyes settled in during the second and third sets, establishing scoring runs that propelled them to a victory in straight sets. OSU (6-0) now has a quick turnaround hosting No. 14 Penn State on Tuesday at St. John Arena at 7 p.m. It will be the teams’ 110th meeting since 1971. The Nittany Lions come into the matchup after falling to 3-3 last Thursday in a heartbreaker to No. 10 Loyola-Chicago in five sets. Penn State is 71-38-1 against OSU all-time, but has only managed to win one of the last five meetings, including losses in both meetings last season. A win on Tuesday would move the Buckeyes’ winning streak to 30 games. The school record is 32 games set at the end of the 1969 and beginning of the 1970 seasons. The Buckeyes will have to watch out for Penn State’s top-hitter, senior outside hitter Chris Nugent. He leads his team with 92 kills on the season. OSU faces stiff competition at the net on offense as well with Penn State’s defense ranking 10th in digs per set. Redshirt sophomore libero leads Penn State with 70 digs. 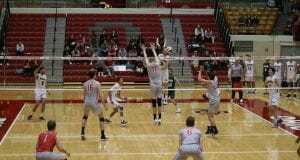 OSU will counter Penn State’s defense with its leading scorers in junior outside hitter Nicolas Szerszen and senior opposite Miles Johnson. Johnson leads the team in kills with 80. He gained in 1000th career kill in OSU’s game against Stanford on Jan. 14, becoming the 15th Buckeye to reach the mark. 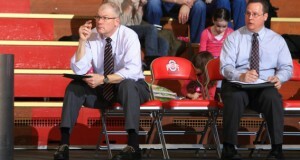 After Penn State, OSU has back-to-back matches on Friday and Saturday against Barton College and No. 4 Long Beach State at St. John Arena.